Breaking: AOL has named a new CEO and chairman. 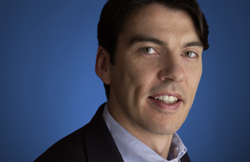 Tim Armstrong, who headed up ad sales in the Americas for Google, will replace Randy Falco as chairman and CEO. AOL President and COO Ron Grant will also be leaving the company. Armstrong’s name has been bandied about as a potential CEO or top executive at several companies. He takes on a challenging post at AOL, which does not have the strength of either Google or even Yahoo in terms of advertising assets or traffic. This was a very closely held hiring, say our sources – even top execs at AOL weren’t told about Falco’s leaving until just before the press release went out earlier this afternoon. Falco came from NBC when his predecessor Jonathan Miller was kicked out. Falco reorganized AOL, focusing on combining its portal (which still generates a huge amount of traffic) with its advertising assets—now bundled together under Platform-A. His strategy was to make AOL an ad network, with AOL’s own properties serving as a foundation and source of guaranteed inventory. But the advertising strategy never quite took hold. Partly, that was because the economy blew up. Last quarter, advertising revenues at AOL were down 18 percent, total revenues were down 23 percent, and the company took a $2.2 billion writedown for previous acquisitions. Yahoo, however, saw only a 2 percent decline in display advertising during the same quarter, and a one percent decline in overall revenues. Google’ revenues, meanwhile, grew 18 percent. powered by search advertising. Armstrong was responsible for a big chunk of that revenue, and his expertise in the still-growing part of online advertising—search—no doubt made him a big catch for Time Warner CEO Jeff Bewkes. AOL definitely has a sales issue, as is clear by its relative performance to Yahoo and Google . And Armstrong is seen as someone who can help solve that, along with another recent hire, Greg Coleman from Yahoo. Coleman is the new head of sales at AOL. But what would entice Armstrong to leave Google, especially if he was the beneficiary of some of the recently repriced options? Time Warner wants to get rd of AOL. It was looking to sell it outright, but now it is gearing up more for an eventual spin-off. If Armstrong can get AOL in shape for an IPO or make it attractive enough for a buyout offer from Microsoft or some other acquirer, he will get his payday. NEW YORK, March 12, 2009 – Tim Armstrong, Google Senior Vice President, has been named Chairman and CEO of AOL, LLC, Time Warner Inc. (NYSE:TWX) Chairman and CEO Jeff Bewkes announced today. Current AOL Chairman and CEO Randy Falco and President and COO Ron Grant plan to leave the company after a transition period.